September 2, 2014 September 2, 2014 Nefer Khepri, Ph. 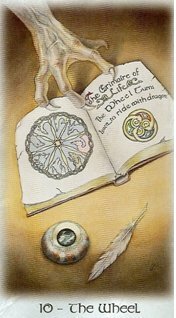 D.
The Wheel of Fortune, Celtic Dragon Tarot. (C) Lisa Hunt & Llewellyn Publishing, 1999. Something really neat happened to me & it involves Tarot toward the end of the story so I thought I’d share here since many of you are into Tarot as collectors, readers, and/or artists. For those who know me via Facebook, I work at home running my internet business through which I offer readings & visionary artwork. I am also a deck creator. As a result of working on the computer I don’t get out much so I don’t have many local friends. I met someone under incredibly tragic circumstances (my daughter is best friends with Cassidy Stay, the sole survivor of a family massacre of six here in Spring, TX). We were leaving Cassidy’s old house after we had gone to light a candle & pray for the family. As we were leaving my daughter saw another school friend go into a house & we went over as she needed a friend at that moment. Turns out the girl didn’t even live there. She was visiting for the very first time, or maybe 2nd time, I forget. Now, how odd was that? The timing had to have been PERFECT for my daughter to see her friend enter that house. As it was, that morning as the horrible news about the Stays unfolded, I called my husband totally distraught. He was so upset that he immediately came home from work. I told them that at some point that day we would go to the Stay’s home and light a candle and pray for them. I left it totally open-ended as to when we would go. Instead, we all got into the car and drove the seven minutes it takes us to get over to that neighborhood. We lit the candle and prayed under the painful scrutiny of the media. Some photographer was next door trying to take pictures of my daughter on the Stays’ front porch as we prayed. How LOW is that? I blocked her as best I could and shielded her as we left so no one could get a picture of her. Returning to our car she spied her friend go into a house she automatically assumed was her friend’s home. The Star, Celtic Dragon Tarot. (C) Lisa Hunt & Llewellyn Publishing, 1999.
invited us in. As she told me the girl wasn’t hers, and was in fact visiting for the first or second time, an image flashed into my mind of the Wheel of Fortune and The Star side by side. I don’t often “think in Tarot,” so this was very odd and I made a mental note of it. The mother and I immediately hit it off & she was very nice. She later invited my daughter and I to go tie ribbons around trees at her son’s school in memory of the Stays. My daughter & I were happy to do this. Now, here is where the Tarot comes into the story again. What does she then pull out of a cabinet? My all-time favorite Tarot deck, “Celtic Dragon Tarot,” by Lisa Hunt! I gasped, told her that was my favorite and she declared, “Kismet!” and we both laughed. However, that has turned out to be very true. I knew when those 2 Tarot cards popped into my head this would be something special, something fated to occur; and, that the universe had brought us together, under extremely terrible circumstances to be sure, but I now have a new friend who is so like-minded with me that it’s kind of scary. 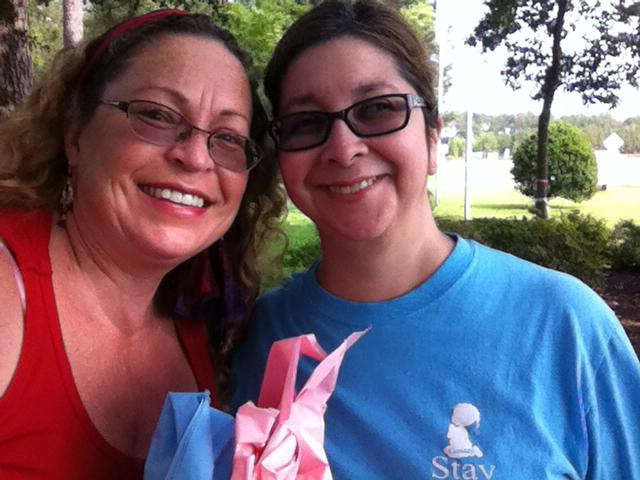 Rosemarie & I after tying memorial ribbons around trees. had to be visiting Rose’s daughter, we had to be out on the street at that exact moment, my daughter had to see her friend go into Rose’s house. All the cogs on all the wheels had to align just perfectly for Rose and I to ever have met. Some days I am truly amazed at how the universe works. If this meeting was not orchestrated by a Higher Hand, than I don’t know what is. The universe truly does work in mysterious ways. 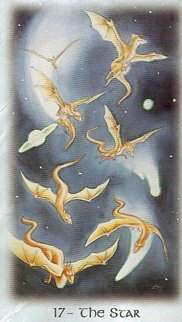 Magickal-Musings.com: candle work, Tarot & Lenormand readings, visionary artwork (my artwork will soon be branching off into its own sister-site). Egyptian Lenormand: my self-published deck of which only 6 signed & numbered copies remain. To be published later this year by Schiffer Books & available at Amazon.com for pre-order. Previous Deck Review: The Eclectic Gypsy Cards.